RSVP to info [at] mttremperarts.org or call 845-688-9893. Adult Ballez is a joyful class that strives to re-imagine what ballet can be, who it can be for, and how it can be done. Shifting the focus away from traditional ideas of technical virtuosity, participants instead explore the virtuosity of genderqueer embodiment, practice energetic mirroring, learn inclusive partnering techniques, seek out (and destroy) our culturally constructed biases, and discover new freedom to witness the beauty of one another as we dance to the beats of queer icons! Starting with authentic (fantasy) movement, we warm-up at the barre, then move to center to turn, jump, practice partnering, and help each other fly across the floor. Classes are open to all queers and allies. Socks are useful, ballet shoes not required, and beginner to advanced levels are all welcome. 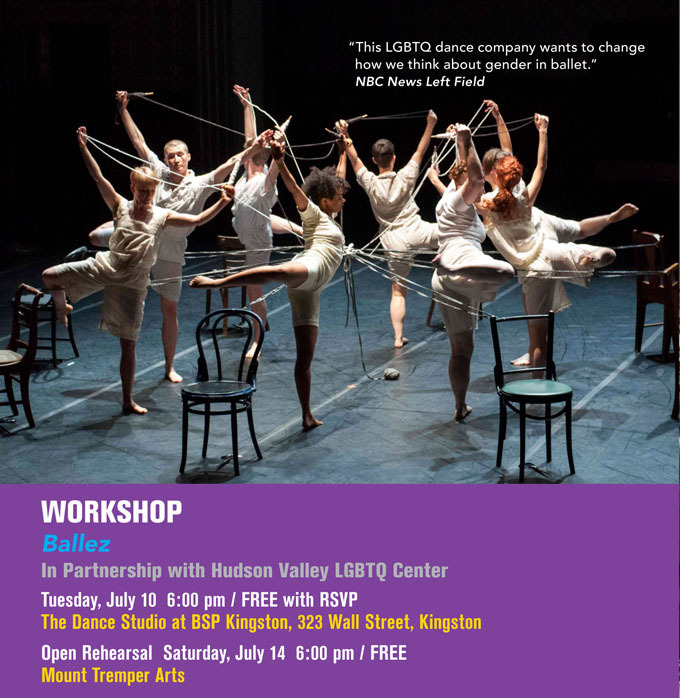 Katy Pyle is Artistic Director and choreographer of Ballez, a dance company re-imagining the culture and narratives of classical ballet to include lesbian, transgender, and queer people through large-scale story ballets, open classes, and public engagement. Hudson Valley LGBTQ Center provides services, professional resources, and programs that unite the lesbian, gay, bisexual, transgender, and queer/questioning community across lines of age, race, gender, and economics.